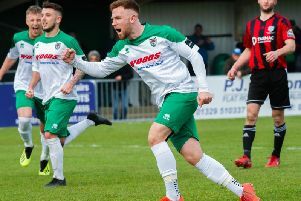 Rocks bosses Jack Pearce and Robbie Blake have promised fans their injury-depleted troops will battle until the very last game of the season to try to clinch a Bostik premier play-off spot. The list of absentees grows by the week and full-back Calvin Davies, midfielder Doug Tuck and striker Jimmy Muitt are all likely to miss this Saturday’s vital visit to Margate. With winger Mason Walsh struggling to last 90 minutes as he gets over a pelvic injury and the hunt for new players proving difficult, Bognor are struggling to field a strong starting line-up. But Pearce and Blake have praised the squad for continuing to work hard and show commitment to the cause – and have insisted they are still right in the mix for a top-five finish and a chance of promotion. They now have two away games – a trip to Enfield on Saturday week follows the Margate game. After that on Tuesday week it's the home Sussex Senior Cup semi-final versus Brighton under-23s. There was a deflated air around most of Nyewood Lane on Saturday after the Rocks had to settle for a 2-2 draw against fierce rivals Worthing having been 2-0 up with 16 minutes. The loss of three players to injury in the second half and contentious penalty and free-kick decisions that led to Worthing’s two goals were all big factors. Pearce said: “At the end of it, everyone in Worthing was highly delighted and everyone in Bognor felt depressed, yet the teams took a point each and we are only two points and two places behind them in the table. “To lose three of your ten outfield players to injury is one half is always going to be difficult and I challenge any club at our level to cope well with that. “In the past couple of weeks we’ve lost Dan Smith to another club, his replacement Leon Maloney to illness, Jimmy Muitt to a knee injury, Calvin Davies to another knee injury, Doug Tuck to a pulled calf muscle and Mason Walsh, again, to a pelvic problem. That’s in addition to Jimmy Wild and Gary Charman, who are out longer-term, and Keaton Wood and Corey Heath, who are coming back but have not played 90 minutes for a long time. “We had six people training on the Tuesday before the Worthing game and a few more on the Thursday. It’s gone downhill again very quickly after we were in a position where we had a few coming back. The Rocks’ mood on Saturday was not helped by Worthing being awarded a penalty for what looked like accidental handball by skipper Harvey Whyte and then a contentious free-kick for an alleged foul by Richard Gilot that led to the Mackerels’ equaliser. Pearce said: “Refereeing decisions change games. I thought the referee overall did well but the one decision which was major, I don’t think he made in line with the laws of the game. I didn’t think it was a penalty. “People say it’s a penalty if a ball hits a hand and the player’s hands aren’t down by his side. But to me having your hands by your side is a very unnatural position. You don’t run with your hands down by your side. In this case I didn’t see it as the arm moving to the ball. The good news for Worthing was it was at their end. They had a few hundred people behind the goal shouting for it. “When they got back to 2-1 I thought we were not going to win unless we picked up. We had to put a centre-half on up front because of players getting injured. “I thought we’d weathered the storm and might win the game but then we played the ball out wide and made the wrong choice and we lost it and conceded a free-kick, and that led to their equaliser. Meanwhile Blake credited his players for battling hard against Worthing and said it was frustrating to end up drawing 2-2. “We don’t just get the rub of the green. I don’t think it’s a penalty. The skipper has not moved his arm towards the goal. And I don’t think that was a free-kick at the end either," said Blake. “The lads have got to give themselves a lot of credit. We had three centre-halves on the bench. We scored and then took control but in the second half they started the better. We need to be braver on the ball. Blake shot down a suggestion the result meant the play-off push was over. “We’re two points behind Worthing and they’re fifth, so how can you say they’re gone? Anyone down to ninth or tenth I think you can say is still in it. “When you lose Dan Smith and Jimmy Muitt that’s 40 goals out of your team. With Jimmy’s injury it’s not good but we hope he might be out for only two weeks or so. We’ve been killed by injuries and loanees going back. But sometimes when it’s not going for you it can galvanise you and make you stick together. And in terms of commitment and fight, we had it against Worthing. “We have to see games out because it’s happened too much. I’ve said to the players ‘get your heads up, you’ve been terrific all season’. We have a bit of an unbalanced team at the moment and that’s not easy to address.